The Secretary of State of California is the chief clerk of the U.S. state of California, overseeing a department of 500 people. The Secretary of State is elected for four year terms, like the state's other constitutional officers; the officeholder is restricted by term limits to two terms. 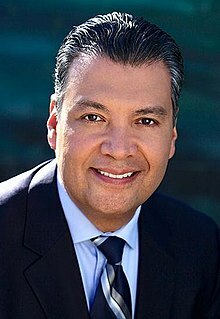 The current Secretary of State, Alex Padilla, took office on January 5, 2015. The Secretary of State is California's Chief Elections Officer, overseeing all federal and state elections in the state and maintaining a database of registered voters. The officeholder is also responsible for disclosure of campaign and lobbyist financial information, under the California Political Reform Act of 1974. The Office of the Secretary of State has a number of responsibilities related to corporations; the largest portion office is the Business Programs Division, which handles corporate filings. The Business Entities Section processes, files and maintains records related to corporations, limited liability companies, partnerships and other business entities conducting or planning to conduct business in California. ^ "Ca - Departments". www.allgov.com. Retrieved February 19, 2017. ^ "Safe at Home". Secretary of State of California. Retrieved January 10, 2017. ^ "Board of Trustees - California Museum". www.californiamuseum.org. Retrieved February 19, 2017. ^ Library, California State. "California State Library - California State Librarians". www.library.ca.gov. Retrieved February 19, 2017.